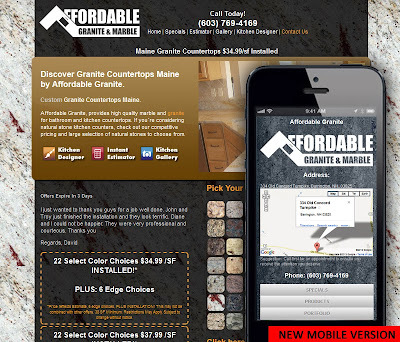 GraniteMakeover.com Now has a new mobile website version for all its customers! All the great content but Just a new look for mobile. Your mobile website now has all your specific content updated in real-time. A mobile website is essential to your online presence today. A mobile website should be designed to perform a slightly different function than the traditional website. The screen is small and the Users purpose for locating you on mobile is different then a traditional website. Our new mobile website does exactly this. When you partner with GraniteMakeover.com in your area you not only get great placement with a great brand and a design that has converted into over 15 million in sales in the last 12 months but you also get a mobile website that will convert even more customers into prospects by providing them with the right information at the right time! If you would like a mobile website for your business contact us today.